The trip began at night in New York City, under the light of a bright moon which made for great visibility. After a few miles they encountered fog conditions, and hailed a startled boat crew to ask their location. They stopped over for breakfast in Noank, Connecticut, before proceeding along the Connecticut coastline, eventually reaching Massachusetts. They came down at a location known as Brant Rock in the town of Marshfield. As the balloon alighted, winds dragged it towards the water until its movement was halted by the anchor. The two men then climbed out and secured it to a fence. The only injury was a minor cut to Mr. Kanbenshue’s head. There is more information about Mr. Knabenshue to be found at other internet sites. 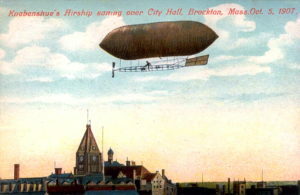 In early October of 1907, Roy Knabenshue was performing at the Danbury Fair in Danbury, Connecticut, when the motor to his airship suddenly failed while he was in the air. With no way to control the ship, he was forced to descent, and came down in a tree. Knabenshue was not hurt.